The United States Armed Forces[N 1] are the military forces of the United States of America. They consist of the Army, Navy, Marine Corps, Air Force, and Coast Guard. The U.S. has a strong tradition of civilian control of the military. The President of the United States is the military's overall head, and helps form military policy with the U.S. Department of Defense (DoD), a federal executive department, acting as the principal organ by which military policy is carried out. The DoD is headed by the Secretary of Defense, who is a civilian and Cabinet member. The Defense Secretary is second in the military's chain of command, just below the President, and serves as the principal assistant to the President in all DoD-related matters. To coordinate military action with diplomacy, the President has an advisory National Security Council headed by a National Security Advisor. Both the President and Secretary of Defense are advised by a seven-member Joint Chiefs of Staff, which includes the head of each of the Defense Department's service branches as well as the chief of the National Guard Bureau. Leadership is provided by the Chairman of the Joint Chiefs of Staff and the Vice Chairman of the Joint Chiefs of Staff. The Commandant of the Coast Guard is not a member of the Joint Chiefs of Staff. All of the branches work together during operations and joint missions, under the Unified Combatant Commands, under the authority of the Secretary of Defense with the exception of the Coast Guard. The Coast Guard falls under the administration of the Department of Homeland Security and receives its operational orders from the Secretary of Homeland Security. The Coast Guard may be transferred to the Department of the Navy by the President or Congress during a time of war. All five armed services are among the seven uniformed services of the United States; the others are the U.S. Public Health Service Commissioned Corps and the National Oceanic and Atmospheric Administration Commissioned Corps. From the time of its inception, the military played a decisive role in the history of the United States. A sense of national unity and identity was forged as a result of victory in the First Barbary War and the Second Barbary War. Even so, the Founders were suspicious of a permanent military force and not until the outbreak of World War II did a large standing army become officially established. The National Security Act of 1947, adopted following World War II and during the Cold War's onset, created the modern U.S. military framework; the Act merged previously Cabinet-level Department of War and the Department of the Navy into the National Military Establishment (renamed the Department of Defense in 1949), headed by the Secretary of Defense; and created the Department of the Air Force and National Security Council. The U.S. military is one of the largest militaries in terms of number of personnel. It draws its manpower from a large pool of paid volunteers; although conscription has been used in the past in various times of both war and peace, it has not been used since 1972. As of 2013, the U.S. spends about $554.2 billion annually to fund its military forces, and appropriates approximately $88.5 billion to fund Overseas Contingency Operations. Put together, the U.S. constitutes roughly 39 percent of the world's military expenditures. The U.S. Armed Forces as a whole possess large quantities of advanced and powerful equipment, along with widespread placement of forces around the world, giving them significant capabilities in both defense and power projection. These forces demobilized in 1784 after the Treaty of Paris ended the War for Independence. The Congress of the Confederation created the United States Army on 3 June 1784, although the Army's founding is celebrated as occurring on 14 June 1775. The 1787 adoption of the Constitution gave the Congress the power to "raise and support armies," "provide and maintain a navy," and to "make rules for the government and regulation of the land and naval forces," as well as the power to declare war and gave the President of the United States the responsibility of being the military's commander-in-chief. Rising tensions at various times with Britain and France and the ensuing Quasi-War and War of 1812 quickened the development of the United States Navy (established 13 October 1775) and the United States Marine Corps (established 10 November 1775). The United States Coast Guard dates its origin to the founding of the Revenue Cutter Service on 4 August 1790; that service merged with the United States Life-Saving Service in 1915 to establish the Coast Guard. The United States Air Force was established as an independent service on 18 September 1947; it traces its origin to the formation of the Aeronautical Division, U.S. Signal Corps in 1907 and was part of the U.S. Army before becoming an independent service. The reserve branches formed a military strategic reserve during the Cold War, to be called into service in case of war. Time magazine writer Mark Thompson has suggested that with the Global War on Terrorism, the reserves deployed as a single force with the active branches and America no longer has a strategic reserve. The U.S. has the world's largest defense budget. In fiscal year 2010, the Department of Defense had a base budget of $533.8 billion. An additional $130.0 billion was requested for "Overseas Contingency Operations" in the War on Terrorism, and over the course of the year, an additional $33 billion in supplemental spending was added to Overseas Contingency Operations funding. Outside of direct Department of Defense spending, the U.S. spends another $218–262 billion each year on other defense-related programs, such as Veterans Affairs, Homeland Security, nuclear weapons maintenance, and the State Department. In fiscal year 2009, major defense programs also saw continued funding. $4.1 billion was requested for the next generation fighter, F-22 Raptor, which was to roll out an additional twenty planes for FY 2009. $6.7 billion was requested for the F-35 Lightning II, which is still in development. Sixteen planes will be built as part of the funding. The Future Combat System program is expected to see $3.6 billion for its development. A total of $12.3 billion was requested for missile defense, which includes Patriot CAP, PAC-3 and SBIRS-High. In his Fiscal Year 2011 budget, President Obama has proposed a 4% increase in Department of Defense spending, followed by a 9% decrease in FY 2012, with funding remaining level in subsequent years. Loren Thompson has blamed the "vast sums of money" squandered on cutting-edge technology projects that were then canceled on short sighted political operatives who lack a long term perspective in setting requirements. The result is that the number of items bought under a given program are cut. The total development costs of the program are divided over fewer platforms, making the per-unit cost seem higher and so the numbers are cut again and again in a death spiral. Critical parts of the Obama future years plan are the cost containment measures provided by the Patient Protection and Affordable Care Act and the Obama administration's energy policy as health care and fuel costs are the two fastest growing parts of the defense budget. As of 31 January 2013, 1,429,995 people were on active duty in the armed forces, with an additional 850,880 people in the seven reserve components. It is an all-volunteer military, but conscription through the Selective Service System can be enacted at the President's request and Congress' approval. All males aged 18 through 25 who are living in the U.S. are required to register with the Selective Service for a potential future draft. From the U.S.'s establishment to September 2012, 40 million Americans have served in the United States Armed Forces. In early 2007, Secretary of Defense Robert Gates proposed to the President to increase the overall size of the Army and Marine Corps to meet the needs of the War on Terrorism. Current plans are to increase the Army to 547,400 and the Marine Corps to 202,000 by 2012. The expansion will cost a total of $90.7 billion between 2009 and 2013 as the Navy and Air Force undergo a limited force reduction. In addition, in 2009, Gates proposed increasing the size of the Army by 22,000 troops in order to reduce fatigue from multiple trips overseas, and to compensate for troops who are in recovery away from their units. The Fiscal Year 2011 Department of Defense budget request plan calls for an active military end strength of 1,406,000, an increase of 77,500 from the 2007 baseline as a result of increments in the Army (65,000 more troops) and Marine Corps (27,100 more troops) strength and decrements in the Navy (13,300 fewer troops) and Air Force (1,300 fewer troops) strength. As in most militaries, members of the U.S. military hold a rank, either that of officer, warrant, or enlisted, to determine seniority and eligibility for promotion. Those who have served are known as veterans. Rank names may be different between services, but they are matched to each other by their corresponding paygrade. Officers who hold the same rank or paygrade are distinguished by their date of rank to determine seniority. Officers who serve in certain positions of office of importance set by law, outrank all other officers in active duty of the same rank and paygrade, regardless of their date of rank. Due to a declinining supply of qualified recruits, due in part to a lack of complementarity between the US education system and the needs of the military as well as the general quality of the US education system at the primary and secondary levels, the armed forces has considered seeking math and science qualified recruits from foreign countries, such as through accelerated citizenship for foreign nationals. Currently, only one in four Americans of the proper age meet the moral, academic and physical standards for military service. These numbers do not take into account the use of Private Military and Private Security Companies (PSCs). Quarterly PSC census reports are available for USCENTCOM area of operations, Iraq and Afghanistan. As of March 2011, in Afghanistan, there were 18,971 private security contractor (PSC) personnel working for DoD; in Iraq, there were 9,207 private security contractor personnel, down from a high of 15,279 in June 2009. As of October 2012, in Afghanistan, there were 18,914 PSC personnel working for DoD; in Iraq, there were 2,116 PSC personnel. The same document explains that the total number of DoD contractor personnel in USCENTCOM area of operations, Iraq and Afghanistan is over 137,400. Reported PSCs are only part of them. As of 31 December 2010, U.S. armed forces were stationed in 150 of the world's 192 countries; the number of non-contingent deployments per country ranges from 1 in Suriname to over 50,000 in Germany. Some of the largest deployments are: 103,700 in Afghanistan, 52,440 in Germany (see list), 35,688 in Japan (USFJ), 28,500 in South Korea (USFK), 9,660 in Italy, and 9,015 in the United Kingdom. These numbers change frequently due to the regular recall and deployment of units. Altogether, 77,917 military personnel are located in Europe, 141 in the former Soviet Union, 47,236 in East Asia and the Pacific, 3,362 in North Africa, the Near East, and South Asia, 1,355 in sub-Saharan Africa and 1,941 in the Western Hemisphere excluding the U.S. itself. As of 31 December 2009, a total of 1,137,568 personnel were on active duty within the U.S. and its territories (including 84,461 afloat). The vast majority, 941,629 of them, were stationed at various bases within the Contiguous United States. There were an additional 37,245 in Hawaii and 20,450 in Alaska. 84,461 were at sea, 2,972 in Guam, and 179 in Puerto Rico. Prospective service members are often recruited from high school or college, the target age being those ages 18 to 35 in the Army, 18 to 28 in the Marine Corps, 18 to 34 in the Navy, 18 to 27 in the Air Force, and 18 to 27 (up to age 32 if qualified for attending guaranteed 'A' school) in the Coast Guard. With the permission of a parent or guardian, applicants can enlist at the age of 17 and participate in the Delayed Entry Program (DEP). In this program, the applicant is given the opportunity to participate in locally sponsored military-related activities, which can range from sports to competitions (each recruiting station DEP program will vary), led by recruiters or other military liaisons. After enlistment, new recruits undergo Basic Training (also known as boot camp in the Marine Corps, Navy and Coast Guard), followed by schooling in their primary Military Occupational Specialty (MOS) or rating at any of the numerous training facilities around the world. Each branch conducts basic training differently. For example, Marines send all non-infantry MOS’s to an infantry skills course known as Marine Combat Training prior to their technical schools, while Air Force Basic Military Training graduates attend Technical Training and are awarded an Air Force Specialty Code (AFSC) at the apprentice (3) skill level. All non-combat arms Army recruits undergo Basic Combat Training (BCT), followed by Advanced Individual Training (AIT), while all combat arms recruits go to One Station Unit Training (OSUT) which combines BCT and AIT, while the Navy send its recruits to Recruit Training and then to "A" schools to earn a rating. The Coast Guard's recruits attend basic training and follow with an "A" school to earn a rating. Initially, recruits without higher education or college degrees will hold the pay grade of E-1, and will be elevated to E-2 usually soon after the completion of Basic Training. Different services have different incentive programs for enlistees, such as higher initial ranks for college credit and referring friends who go on to enlist as well. Participation in DEP is one way recruits can achieve rank before their departure to Basic Training. There are several different authorized pay grade advancement requirements in each junior enlisted rank category (E-1 to E-3), which differ by service. Enlistees in the Army can attain the initial pay grade of E-4 (Specialist) with a full four-year degree, but the highest initial entry pay grade is usually E-3 (Members of the Army Band program can expect to enter service at the grade of E-4). Promotion through the junior enlisted ranks occurs upon attaining a specified number of years of service (which can be waived by the soldier's chain of command), a specified level of technical proficiency, and/or maintenance of good conduct. Promotion can be denied with reason. With very few exceptions, becoming a non-commissioned officer (NCO) in the United States military is accomplished by progression through the lower enlisted ranks. However, unlike promotion through the lower enlisted tier, promotion to NCO is generally competitive. NCO ranks begin at E-4 or E-5, depending upon service, and are generally attained between three and six years of service. Junior NCOs function as first-line supervisors and squad leaders, training the junior enlisted in their duties and guiding their career advancement. Additionally, all services except for the Air Force have an active warrant-officer corps. Above the rank of Warrant Officer One, these officers may also be commissioned, but usually serve in a more technical and specialized role within units. More recently though they can also serve in more traditional leadership roles associated with the more recognizable officer corps. With one notable exception (helicopter and fixed wing pilots in the U.S. Army), these officers ordinarily have already been in the military often serving in senior NCO positions in the field in which they later serve as a Warrant Officer as a technical expert. Most Army pilots have served some enlisted time. It is also possible to enlist, complete basic training, go directly to the Warrant Officer Candidate school at Fort Rucker, Alabama, and then on to flight school. Officer Candidate School (OCS): This can be through active-duty OCS academies, or, in the case of the National Guard, through state-run academies. Direct commission: civilians who have special skills that are critical to sustaining military operations and supporting troops may receive direct commissions. These officers occupy leadership positions in the following areas: law, medicine, dentistry, pharmacy, nurse corps, intelligence, supply-logistics-transportation, engineering, public affairs, chaplain corps, oceanography, and others. Officers receive a commission assigning them to the officer corps from the President (with the consent of the Senate). To accept this commission, all officers must take an oath of office. The rank of General of the Armies is considered senior to General of the Army, but was never held by active duty officers at the same time as persons who held the rank of General of the Army. It has been held by two people: John J. Pershing who received the rank in 1919 after World War I, and George Washington who received it posthumously in 1976 as part of the American Bicentennial celebrations. Pershing, appointed to General of the Armies in active duty status for life, was still alive at the time of the first five-star appointments during World War II, and was thereby acknowledged as superior in grade by seniority to any World War II era Generals of the Army. George Washington's appointment by Public Law 94-479 to General of the Armies of the United States was established by law as having "rank and precedence over all other grades of the Army, past or present," making him not only superior to Pershing, but superior to any grade in the United States Army in perpetuity. In the Navy, the theoretically corresponding rank to General of the Armies is Admiral of the Navy. It was never held by active duty officers at the same time as persons who held the rank of Fleet Admiral. George Dewey is the only person to have ever held this rank. After the establishment of the rank of Fleet Admiral in 1944, the Department of the Navy specified that the rank of Fleet Admiral was to be junior to the rank of Admiral of the Navy. However, since Dewey died in 1917 before the establishment of the rank of Fleet Admiral, the six-star rank status has not been totally confirmed. Under current Department of Defense regulation, the various components of the Armed Forces have a set order of seniority. Examples of the use of this system include the display of service flags, placement of Soldiers, Marines, Sailors, and Airmen in formation, etc. When the United States Coast Guard shall operate as part of the Navy, the cadets, United States Coast Guard Academy, the United States Coast Guard, and the Coast Guard Reserve shall take precedence, respectively, after the midshipmen, United States Naval Academy; the United States Navy; and Navy Reserve. Other training and auxiliary organizations of the Army, Marine Corps, United States Merchant Marine, Civil Air Patrol, and United States Coast Guard Auxiliary, as in the preceding order. Note: While the U.S. Navy is actually older than the U.S. Marine Corps, the Marine Corps takes precedence over the Navy due to previous inconsistencies in the Navy's birth date. The Marine Corps has recognized its observed birth date on a more consistent basis. The Second Continental Congress established the Navy on 13 October 1775 and the Marine Corps on 10 November 1775. The Navy did not officially recognize 13 October 1775 as its birth date until 1972 when, then-Chief of Naval Operations, Admiral Elmo Zumwalt authorized it to be observed as such. ↑ As stated on the official U.S. Navy website, "armed forces" is capitalized when preceded by "United States" or "U.S."
↑ "United States Army". http://www.goarmy.com/about/service-options/enlisted-soldiers-and-officers/enlisted-soldier.html. Retrieved 18 June 2013. ↑ "United States". The World Factbook. Central Intelligence Agency. https://www.cia.gov/library/publications/the-world-factbook/geos/us.html. Retrieved 29 March 2013. ↑ 3.0 3.1 "Armed Forces Strength Figures for January 31, 2013". United States Department of Defense. http://siadapp.dmdc.osd.mil/personnel/MILITARY/ms0.pdf. Retrieved 29 March 2013. ↑ 4.0 4.1 4.2 4.3 4.4 "H.R. 4310 (112th): National Defense Authorization Act for Fiscal Year 2013". GovTrack. http://www.govtrack.us/congress/bills/112/hr4310/text. Retrieved 29 March 2013. ↑ "US Defense Budget Proposal Released For Fiscal Year 2014". June 6, 2013. http://defenseupdates.blogspot.com/2013/06/us-defense-budget-proposal-released-for.html. ↑ "Organization Chart of the Joint Chiefs of Staff" (pdf). JCS Leadership. Office of the Joint Chiefs of Staff. http://www.jcs.mil//content/files/2012-01/010612094032_The_JS_Org_Chart_as_of_Jan_2012.pdf. Retrieved 22 January 2012. ↑ "STATEMENT BY GENERAL CRAIG R. MCKINLEY CHIEF NATIONAL GUARD BUREAU BEFORE THE SENATE APPROPRIATIONS COMMITEEE SUBCOMMITTEE ON DEFENSE SECOND SESSION, 111TH CONGRESS". http://appropriations.senate.gov/ht-defense.cfm?method=hearings.download&id=aab1ea76-b853-46ee-8348-3efd3b00e4d0. Retrieved 9 November 2011. ↑ Thompson, Mark. "On Guard: A Seventh Member for the Joint Chiefs?" Time Magazine, 13 September 2011. ↑ Friedman, George. "Frittering Away the Strategic Reserve." The Officer, September 2008. ↑ "GAO-06-170T: Army National Guard's Role, Organization, and Equipment Need to Be Reexamined" (PDF). Government Accountability Office. 20 October 2005. http://www.gao.gov/new.items/d06170t.pdf. Retrieved 9 November 2011. ↑ "Funding Levels for Appropriated ("Discretionary") Programs by Agency (Table S–11)" (PDF). Executive Branch of the United States. 2009. http://www.whitehouse.gov/omb/budget/fy2011/assets/tables.pdf. Retrieved 21 December 2010. ↑ "Department of Defense" (PDF). http://www.gpoaccess.gov/usbudget/fy09/pdf/budget/defense.pdf. Retrieved 21 December 2010. ↑ "Death and Taxes". Wallstats.com. http://www.wallstats.com/deathandtaxes/. Retrieved 21 December 2010. ↑ "Table 3.2 – Outlays by Function and Subfunction: 1962–2014". whitehouse.gov. http://www.whitehouse.gov/omb/budget/Historicals/. Retrieved 21 December 2010. ↑ Scott McGaugh (16 February 2013). "Learning from America's Wars, Past and Present U.S. Battlefield Medicine has come". http://m.utsandiego.com/news/2012/sep/16/tp-learning-from-americas-wars-past-and-present/. Retrieved 22 February 2013. ↑ Bender, Bryan (12 January 2007). "Gates calls for buildup in troops". The Boston Globe. http://www.boston.com/news/nation/washington/articles/2007/01/12/gates_calls_for_buildup_in_troops/. Retrieved 11 November 2007. ↑ "FY2009 Defense Budget: Issues for Congress" (PDF). http://www.fas.org/sgp/crs/natsec/2009dodbud.pdf. Retrieved 21 December 2010. 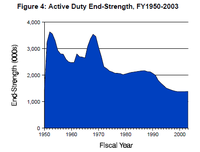 ↑ "Defense Budget, Fiscal Year 2011" (PDF). http://comptroller.defense.gov/defbudget/fy2011/FY2011_Budget_Request_Overview_Book.pdf. Retrieved 21 December 2010. ↑ 28.0 28.1 "Department of Defence Instruction 1310.01: Rank and Seniority of Commissioned Officers" (PDF). United States Department of Defense. 6 May 2006. http://www.dtic.mil/whs/directives/corres/pdf/131001p.pdf. Retrieved 9 November 2011. ↑ Koebler, Jason. "Report: Military Engineer Shortage Could Threaten Security: A STEM shortage could create an employment crunch at the Department of Defense." 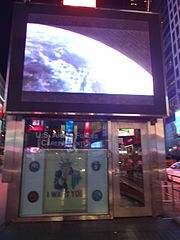 U.S. News & World Report. 7 March 2012. ↑ "tbc". U.S. Department of Defense. 2010. http://prhome.defense.gov/RFM/MPP/ACCESSION%20POLICY/PopRep2010/contents/contents.html. Retrieved 31 December 2010. ↑ "Active Duty Military Personnel by Rank/Grade". United States Department of Defense. http://siadapp.dmdc.osd.mil/personnel/MILITARY/rg1301.pdf. Retrieved 29 March 2013. ↑ "tbc". U.S. Department of Defense. 2011. http://prhome.defense.gov/RFM/MPP/ACCESSION%20POLICY/PopRep2011/appendixb/b_15.html. Retrieved 3 December 2012. ↑ "tbc". U.S. Department of Defense. 2012. http://siadapp.dmdc.osd.mil/personnel/CIVILIAN/fy2012/december2011/december2011.htm. Retrieved 3 December 2012. ↑ "CONTRACTOR SUPPORT OF U.S. OPERATIONS IN THE USCENTCOM AREA OF RESPONSIBILITY TO INCLUDE IRAQ AND AFGHANISTAN" (PDF). US Secretary of Defense. 2012. http://www.acq.osd.mil/log/PS/CENTCOM_reports.html. Retrieved 3 December 2012. ↑ "DOD's Use of PSCs in Afghanistan and Iraq" (PDF). Federation of American Scientists. 2011. http://www.fas.org/sgp/crs/natsec/R40835.pdf. Retrieved 3 December 2012. ↑ "CONTRACTOR SUPPORT OF U.S. OPERATIONS IN THE USCENTCOM AREA OF RESPONSIBILITY TO INCLUDE IRAQ AND AFGHANISTAN" (DOC). US Secretary of Defense. 2012. http://www.acq.osd.mil/log/PS/docs/5A_paper/5A_Oct2012_CORRECTED_EDITION.doc. Retrieved 3 December 2012. ↑ "Active duty military personnel strengths by regional area and by country" (PDF). U.S. Department of Defense. 2010. http://siadapp.dmdc.osd.mil/personnel/MILITARY/history/hst1012.pdf. Retrieved 31 December 2010. ↑ "Active Duty Military Personnel Strengths by Regional Area and by Country". United States Department of Defense. http://siadapp.dmdc.osd.mil/personnel/MILITARY/history/hst0912.pdf. Retrieved 29 March 2013.